How do I restrict contact information for my employees? If you do not want your employees personal information to be visible to their coworkers, you can adjust your settings to hide it. Go to Dashboard > Settings > Company Settings. Scroll to the Restrictions section. It is the first option listed there. 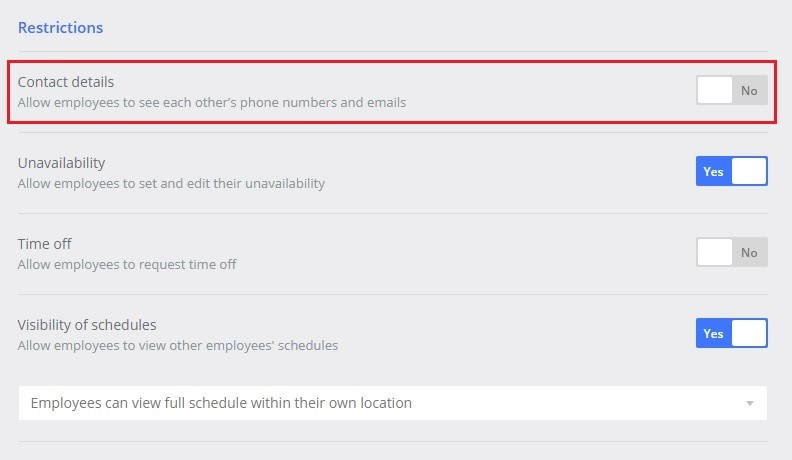 Switch the toggle to No and employees will not be able to view email addresses, phone numbers or birth dates of other employees. Managers and admins are still able to see this info, however. Please note: Employees will still be able to see other employees' names listed for the entire account/company as well as their position and location information.